Ultra compact Bill FCC CB radio is loaded with features such as Weather Channels, 7 Color Display, USB charging socket, and much more. 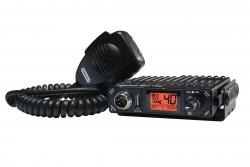 Naples, FL, September 18, 2018 --(PR.com)-- President Electronics, the worldwide leader of CB Radios announced today the launch of their new ultra compact CB radio the “Bill FCC” arriving North America later this month. The Bill FCC is loaded with features such as Weather Channels, 7 Color Display, USB charging socket, NB/ANL, President’s unique ASC (Automatic Squelch Control), Scan, and much more, all in a ultra compact size at $99.00 retail. The President brand is synonymous with advanced technology, quality, and prestige. As such, Consumers who purchase a President Antenna together with a President radio, will get a full five-year warranty on the purchase of their new radio. The full line of high end antennas, feature stainless steel, marine grade construction and comes with an unprecedented 10-year warranty.